Nagano Prefecture (長野県, Nagano-ken) is a prefecture in the Chūbu region of Japan on the island of Honshu. The capital city is Nagano. The capital is the city of Nagano. Nagano Prefecture was created from the area of the former Shinano Province. Nagano was host to the 1998 Winter Olympics. 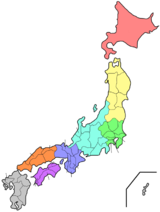 Nagano Prefecture is south of Niigata Prefecture. The eastern borders of Nagano meet Gunma Prefecture, Saitama Prefecture, Yamanashi Prefecture and Shizuoka Prefecture. Nagano's souther border is shared with Aichi Prefecture. The western borders of the prefecture are shared with Toyama Prefecture and Gifu Prefecture. National Parks are established in about 21% of the total land area of the prefecture. ↑ Louis-Frédéric (2005). Japan Encyclopedia. Harvard University Press. p. 682. ISBN 978-0-674-01753-5. ↑ Olympic.org, Nagano 1988; retrieved 2012-8-29. This page was last changed on 14 September 2018, at 15:18.